How to extract: Download the ZIP package and extract a folder of your choice. Launch USBDeview.exe. Optionally, to show the vendor name and product name of your USB devices, download usb.ids to the same folder. Fixed the serial number command-line options (/stop_by_serial, /enable_by_serial, /disable_by_serial, /remove_by_serial) to accept decoded serial numbers. 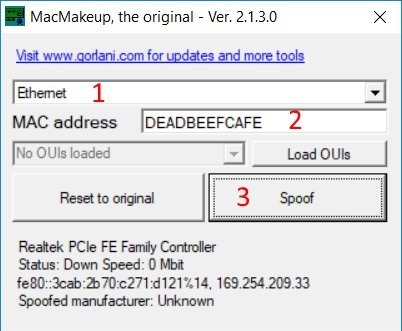 MacMakeup allows you to change the MAC address of any of the network interfaces present on your Windows system. This is sometimes referred as "MAC address spoofing". You can choose a new address of your choice, or get the new one with the help of the tool, which sets the OID part according to your preference. How to extract: Download the ZIP package and extract to a folder of your choice. Launch MacMakeup.exe. Command line switches to automate spoofing. adding a networkaddress=spoofMAC to the registry. MonitorInfoView is a small utility that displays essential information about your monitor, including week/year of manufacture, manufacturer, model, supported display modes etc. This information is extracted from the EDID ("Extended Display Identification Data") records stored on your computer. You can also view the monitor information of multiple computers on your network if you login to these computers with administrator rights. How to extract: Download the ZIP package and extract to a folder of your choice. Launch MonitorInfoView.exe. Works as advertised-good to use if you forget your monitor serial number,previous versions would not tell correct supported resolutions,this works fine. 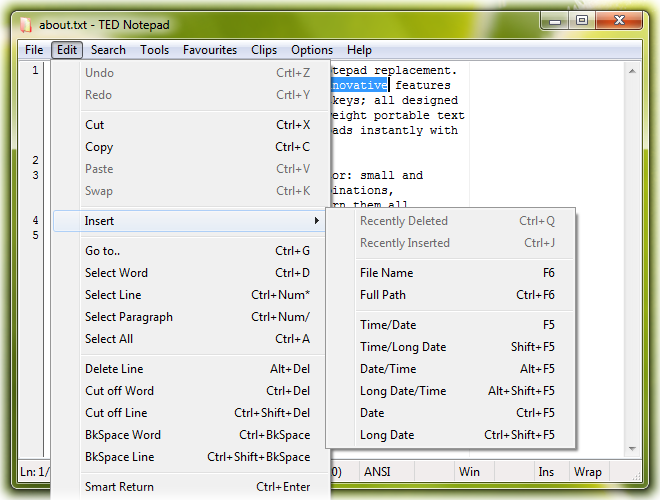 TED Notepad is a small and fast text editor intended as a replacement for Windows notepad. The program offers a variety of interface tools including hotkeys for almost every function, ability to minimize to system tray, favorite files menu, and many more. Additionally, up to nine permanent clipboards, advanced searching, auto-completion, bi-directional editing and many text-processing functions. How to extract: Download the "Portable" ZIP package and extract to a folder of your choice. Launch TedNPad.exe. Was testing some Notepad alternatives the other night, and while TED Notepad is relatively small in size, it uses almost 4x the memory (hovering around 9MB). Just a FYI.